My hope for this year was that I would be able to find the next earliest surviving Christmas adventure, but that has proven to be trickier than I thought. 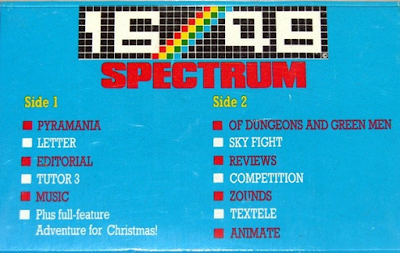 The earliest such game (predating even Merry Christmas) was 1983’s A Christmas Adventure for several systems, including the Apple ][, Commodore 64, and the Spectrum. That was a curious beast: part game, part electronic holiday card and could be customized for your recipient. Most of the versions have been lost to time, but there is an Apple version for sale on the internet, but for far more cash than I could spare for this project. Even if I bought the game, I would not be able to create the disk images required to play it in an emulator. If someone out there wants to take a crack at this for next year, let me know. 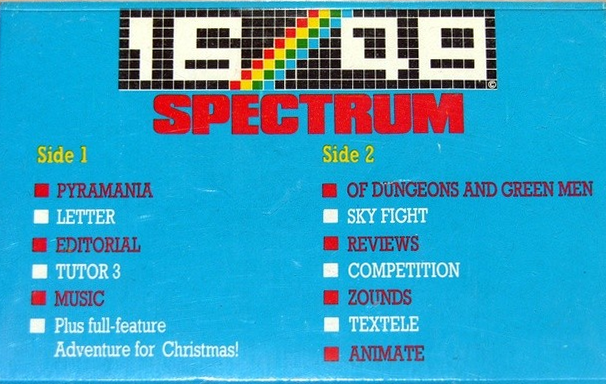 A game so amazing… that it’s title doesn’t even appear on the box. 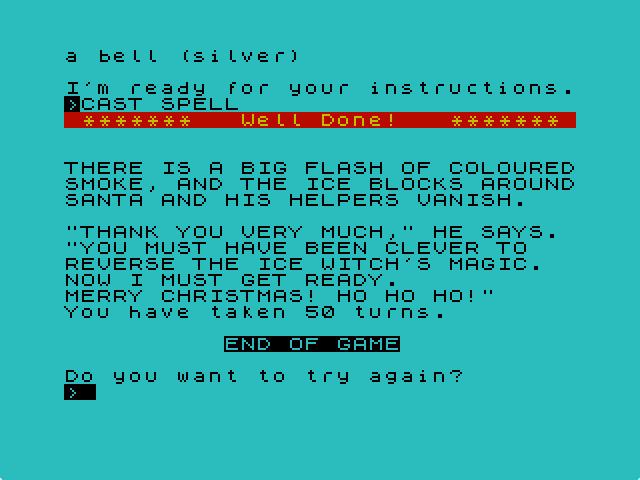 Failing that, the next earliest Christmas-themed adventure I can find is A Spell of Christmas Ice, a text adventure for the ZX Spectrum. It advertises itself as “a very easy adventure for novices and children” which should be right up my alley after having to take a lifeline at the end of Willy Beamish. 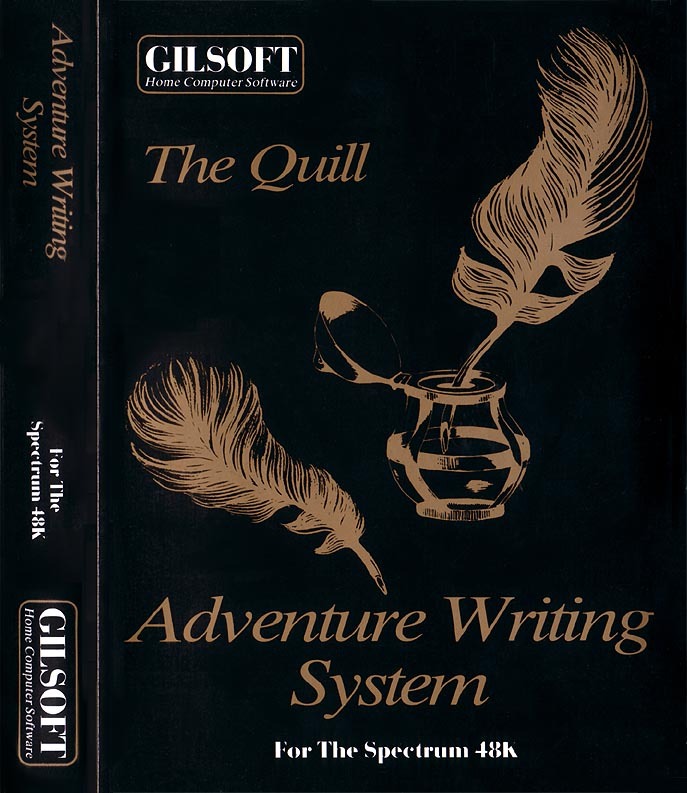 To introduce this game right, I’m going to have to discuss a bit of the history of text adventure games at this point, as well as “tape magazines”. If you just want to get to the Christmas-themed fun, just scroll down. Christmas Ice was written by Mike Turner, a programmer who is credited for several text adventures (and one RPG) in the 1980s. Mike must have an interesting story as he created the only text adventure (that I am aware of) ever to make it to #14 on the UK Albums Chart. How did he manage this, you might ask? He wrote a text adventure, Aural Quest, that was included as an extra on the cassette tape edition of The Stranglers’ 1984 album, Aural Symphony. It may be the first example of “multimedia” content being included on a music album. The music isn’t bad, either. Unfortunately, he drops off the map around 1986 and it is unlikely we will be playing more of his games any time soon. But who knows… do we have any Stranglers fans that fancy writing a Missed Classic? Infinite adventures in a tiny cassette case. The Quill itself is a neat piece of work. You can still read the manual online, but in short it allows you to create and define rooms, objects, vocabulary words, and various conditions in the game and then let’s you amend those with an “event table”, simple programming that ties it all together. The manual gives an example of creating a puzzle where you have to open a safe with a key; the event table entry makes sure you are in the correct room, that the safe is in the room, that you have the key, and that you’ve not already opened the safe before triggering the action, in this case adding a “jewel” to the room and increasing your score. Making a game wasn’t simple, but much easier than building an engine from scratch on the many personal computing platforms of the early 80s. 16/48 tape magazine cover screen for issue #16. The final piece of the puzzle for Christmas Ice was the tape magazine. I have to tell you that I was ignorant of these until researching this post, having been born slightly too late. I remember having a Commodore 64 with a tape drive, but all of my family’s software came on floppy disks. Tape magazines, sometimes called “magnetic magazines”, were software by subscription. Just like a regular magazine, as long as you paid your subscription you would receive a cassette tape in the mail every month. On that tape would be some new software, possibly a game demo, product reviews, and similar. Tapes were cheap to produce and ubiquitous in the early days of computing, but pretty inferior from our point of view: you could only read them in order, they were limited to around 100K of data, and you could only read them at around 50 bytes per second. I’m not sure how anyone lived with that, but I’m sure my son will say the same thing about CD-ROMs. But for our story, tape magazines gave developers a pre-baked distribution platform for their software. Software that could not have stood on its own might have been quite at home in a tape magazine. I hope to learn more about these magazines in the future as my research for this post only scratched the surface. Did you have a subscription to one of these? If so, let us know in the comments. Still with me? Good. It’s time to play the game! 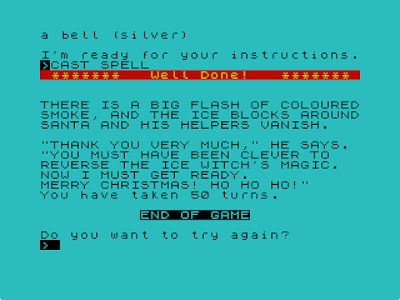 The game begins with an introduction to the story: the evil Ice Witch has cast a spell of some kind on Santa Claus to prevent him from delivering presents on Christmas. We are going to be transported to the north pole to figure out what is going on and to save the day. Pretty typical fare for a Christmas game. I’m not sure whether the “Ice Witch” is a takeoff of the “Snow Queen” from the Hans Christian Anderson tale, but I suppose we'll find out soon enough. Heading north gets you to a crossroads. Continuing north is impossible as the North Pole is “closed for the season”, but east and west work. Heading west, we discover a “scarey” cave and a need for a spell-checker. (The word is in the dictionary as an old-fashioned form of “scary”. I’m not sure I give Mike the benefit of the doubt here.) We have already found the lair of the Ice Witch, a large room with a cute kitty asleep next to a purple throne. Any witch that has a cat is okay in my book. There’s also a witch’s hat on the ground which is immediately taken and worn. A locked trapdoor is in the floor, but we’ll have to come back later. Nothing else to see here; let’s move on. Off to the east is “Santa Claus’s Grotto”, as well as some logs to pick up. The biggest surprise is the lack of elves: this is a gnomes’ workshop! What happened to Santa’s elves? Did he fire them all and hire gnomes? Are they union scabs? Wait. I think the talk of employment action was from last year’s game. Apparently, Santa having alternate helpers is a European thing; David Sedaris famously ran into this while touring and discovered that the Dutch Santa runs around with six to eight black men. Fortunately, gnomes seem a bit less racially charged. I explore the workshop, picking up toys as I go before I hit on the game’s first challenge: maximum inventory size. I suppose I can’t just pick up everything not nailed down. I take my model train and my teddy bear, my logs and my witches hat, and everything else back to the start of the game to store for safekeeping and puzzle-solving. In Santa’s great hall, we finally find out the nature of the spell: he and his gnomes have been encased in ice. In retrospect, that seems obvious given the title of the game. This witch must have slippery fingers because right next to Santa is a little key. One guess what that opens? Yep. The trapdoor in her lair. A couple passes at gathering up the items around the workshop and storing them at the crossroads later, I go to explore that trapdoor. Under her lair, the room is dark. No grues here, but I need a light. Fortunately, one of the miscellaneous items I gathered was a torch. I try to light it and the game helpfully informs me that it is an electric torch. I turn it on, cursing the British for misusing another perfectly good word. In the basement is a wand, a book of spells, and a stuffed crocodile. What does she need a stuffed crocodile for? Back in the witch’s throne room, I try to figure out what to do. I can neither read the spell book nor wave the wand. Eventually I try to “wake cat”. Anyone that owns a cat knows that is a terrible idea on the best days, but this cat turns out to be the Ice Witch and she (against form, now that I think about it) turns me into a frog. Game over. The next attempt is a short one. I quickly grab the torch and the key, get the stuff from her basement, and head to Santa’s room to play around there. It takes me only a few minutes to try “cast spell” in Santa’s room and the ice is melted. I have saved Christmas! Huzzah! Once is enough for me, thanks. 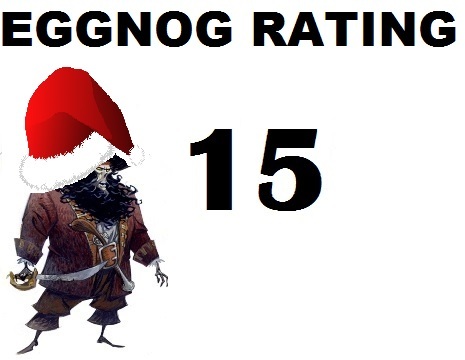 Just like last year, I do not think the “PISSED” rating system is proper for a Holiday-themed game. Once again, I will return to the suspiciously similar “EGGNOG” rating system to evaluate this holiday vignette. Enigmas and Solvability - The game is exactly what it claims to be: a very easy adventure for novices and children. The game has only two real puzzles, with the added difficulty of having to do some inventory juggling because of the extra items (mostly toys) scattered around. Score: 1. Game UI and Items - The Quill-based parser is passable, but already old in the tooth by 1984. There are a few nice perks like blinking and different-colored text used sparingly, but all in all there isn’t much there. The inventory items are almost all extraneous and none of them have descriptions. Colossal Cave received 3 in this category with a very similar look and feel, but I’m going to have to say that was due to its more robust set of interesting objects. Score: 2. Gameworld and Story - The game feels more complete than Merry Christmas did, but we have very little to go on about the witch, why she attacked Santa Claus, or why Santa seems to be living in a cave. There are a few fun quirks like the Ice Witch disguising herself as a cat to take a nap, but not enough of that. Score: 1. Noises and Pretty Pixels - Graphics and sound are both present in this game, although minimally. The game beeps when you enter a command and that is very annoying, but there is a brief victory song played when you win. On the low-quality Spectrum speaker, that song manages to be nearly as annoying as the beeps. The only graphics in the game is the addition of a “Christmas tree” character used with some of the room descriptions. The Spectrum did not include this glyph by default, but features a handful of programmable characters. It’s not much, but it’s a nice touch. Score: 1. Overworld and Environs - The world is tiny, but the text descriptions are well-done and Santa’s Workshop (gnomes and all) seems well defined. I don’t know if I get the “Christmas” spirit so much playing the game, but it’s not terrible. Score: 2. Gregariousness and Thespianism - The prose is overall well done with one or two good room descriptions, but no descriptions on items. I had a chuckle here and there, so I suppose that says something. This is a category that text adventures need to rock in order to offset their low graphics scores, and this one doesn’t quite succeed at that. Score: 2. Running the calculation (1+2+1+1+2+2)/.6 gives us a final score of 15 points! 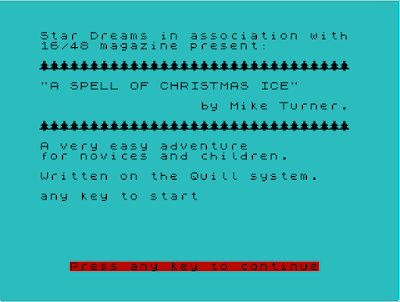 That makes A Spell of Christmas Ice the highest rated Christmas game on this blog ever. Congratulations! Adventure in the Colossal Cave still holds the record for highest-rated text adventure (at 33 points), but we’ll need a much more complete package to catch up with that one. Next week, we’ll be back to business as usual as I wrap up Willy Beamish. Merry Christmas! Also I hope everyone is having the best possible time over this festive period, merry Christmas! It's pretty strange that a British Christmas game would feature gnomes, since the gnomish servants of Father Christmas or Santa Claus are more of a Nordic tradition (tomte/tonttu, as they are called in these parts), while in Britain he has hired elves at least since days of Tolkien. Are those elves the type that fears cold iron or the type that makes arrows out of 'em? Three of them is a little too much but I get you, mate! Good news! I have been talking with a friend of mine (who works for the Internet Archive) about "A Christmas Adventure". If we can get our hands on the game and donate it to them, then he'll make sure it gets put up on the site and we'll be able to play it. It's far too early to think about next Christmas, but would anyone be up for pitching in a few $$$ if we set up a Patreon on similar to try to cover the cost of getting the game off of Retrogames? 150 pounds, or around $220 USD. Far more than I would personally spend on a one-off Christmas game, but perhaps if a few people contributed... But I would say if we buy it, we donate it immediately to the Internet Archive because this stuff should be available for everyone. It's history. I'll put a few quid towards it, if we can spread the cost between a few people.